Thought I’d share with you all a snapshot of my work that has been released during the month of May. Field of Gold – Captured this image in a Rapeseed Field, Scotland. Oriental Garden Lizard – Spotted this guy basking in the warm tropical sun during my recent visit to the Ranganathittu Bird Sanctuary, Karnataka, India. Gathering Food… The White-throated Dipper also known as the European Dipper, Scotland. Caught… The Master of Stealth and Precision – Grey Heron, Scotland. Meerkat – Edinburgh Zoo, Scotland. Mother and Child – Female Mallard with one of her ducklings, Scotland. A baby White-faced Saki monkey peeking out at the world outside as it rides on its mother’s back. Captured this image at the Edinburgh Zoo, Scotland. To receive images such as these, posted daily to your Facebook wall, ‘Like‘ us on Facebook. Today, the 1st of March, 2012, marks the start of Marie Curie Cancer Care’s month-long Great Daffodil Appeal in the UK. Started in 1948, the same year the National Health Service (NHS) was launched, Marie Curie Cancer Care is best known for its network of 2000 nurses, who work in the homes of terminally ill patients across the UK, providing practical care and support. 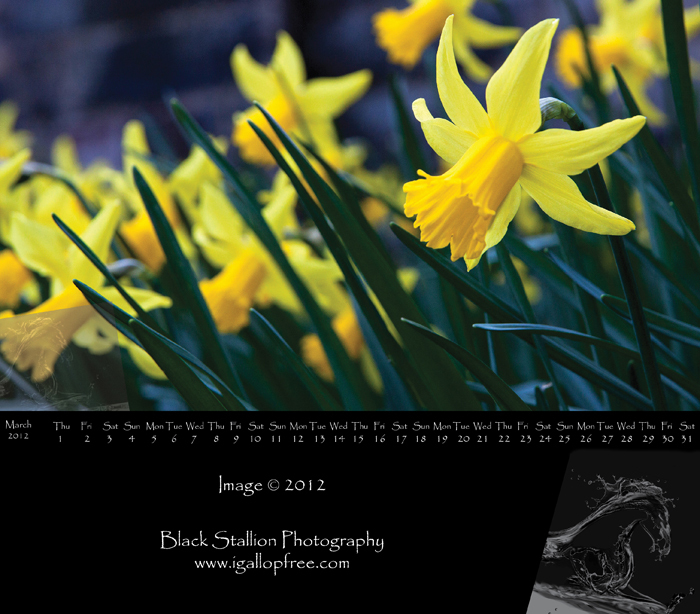 To show our support of the great work done by the Marie Curie nurses and the charity as a whole and to coincide with the start of the Great Daffodil Appeal we, at Black Stallion Country, thought it only fit that we showcase Daffodils on our March Desktop Calendar. Feel free to download the calendar by clicking on the image above and we really hope you’ll use it as your desktop calendar this month serving as a constant reminder of the invaluable service offered by the Marie Curie nurses. Please do share this with family and friends and am sure that if you are willing to offer the charity any practical or monetary support, it would be gratefully received.